How many of us hope to retire comfortably in our golden years? But there are many elderly (35k living alone) in Singapore who do not have that chance. This is why I am heartened by a fundraising campaign called For A Golden Home, which aims to help the needy elderly community by raising $25,000. Funds will enable volunteers to reach out to them in partnership with Project HomeWorks, an on-the-ground initiative that assesses and cleans up their homes to restore basic living conditions. 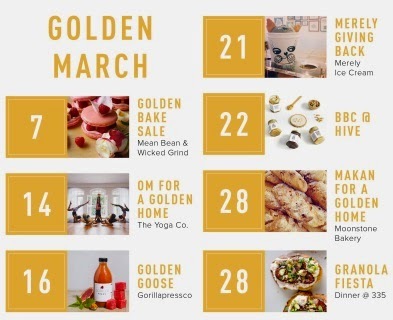 In the month of March the organizers have lined up a series of exciting events from partners like Mean Bean and Wicked Grind, and The Yoga Co.
You can also donate money on the website and 100% of the funds will go towards the campaign with 2.5 times tax exemption. Every share of this video post on their Facebook Page also donates $5, up to $5000! Post by For a Golden Home. Let's all build a better life for the needy elderly among us shall we?